We can prepare bespoke calculations and designs for hostile vehicle mitigation measures (HVM) to suit a range of impact vehicle types and velocities. Furthermore we can specify suitable HVM in accordance with PAS 69. HVM is a critical aspect of most security schemes and is paramount in maximising standoff from your critical assets. DGA have prepared vehicle dynamics assessments (speed of approach studies) for a large number of sites in the UK and across the world, and some of our engineers have successfully attended the HVM course provided by the Centre for the Protection of National Infrastructure (CPNI). The designs we produce for bespoke HVM systems and impact resistant barriers are carried out in accordance with PAS 68 and IWA 14. We can also assist in the arrangement of HVM tests in order to verify the design. 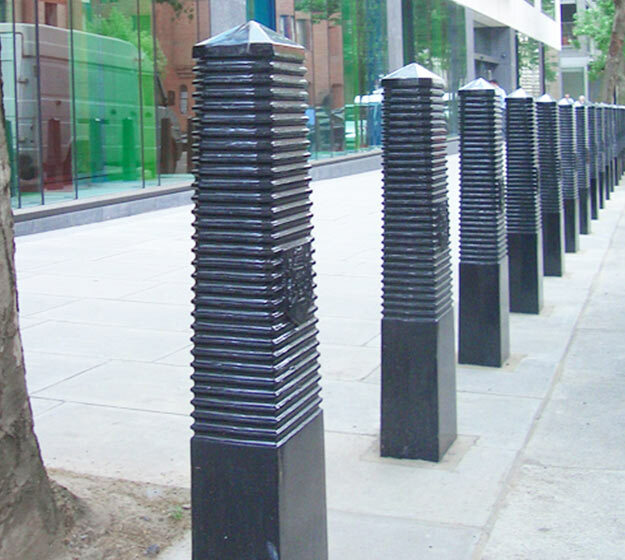 We are proud to be the engineers responsible for the design of the first impact resistant bollard system in 2001 which was successfully tested and used on projects around London. We assisted HOSDB in the Research and Development of HVM in 2001 and were one of the first consultants responsible for assisting with the original development of PAS 68 and 69.